Guys, raise the limit of users!!! please! It’s been temporarily lowered while a fix for the server lag is being tested. It should be raised again next week. this is really super i inc.from work and now i stay at portal and wait for room 15min hahhah nice game really world full and i cant play ,cant mined ,cant explored,cant trade,and cant go to my home planet where i have base!!! i wait to time when game say all worlds full and all ppls in game only stay at portals and wait when anyone leave game . Hi, sorry for the late reply. I just uploaded a short ~40sec video to youtube showing the rubber banding I get on certain worlds. This wasn’t on Lamblis, but it’s the about the same quality of lag. The video is unlisted so you need the URL. If you check it right now, the quality might be low because it is still processing, but the video is 1080p. EDIT: Also, during the lag I wasn’t pressing any keys, FYI. EDIT2: I am in San Diego, California, USA, if that matters at all. I waited 5+ hours for serp to open up and finally gave up on it. My experience last night was that I had to wait 15-18 minutes to get through Phem once. After that trip it was easier for about 2 hours before I called it a night. I also had rubber banding on a planet with very low population (probably under 10, definitely under 20). My connection is 100/100 FiOS on the east coast around 9pm last night. Was this yesterday? The Serp server was down, unrelated to the capacity thing. The devs applied a fix this morning. The message was concluding the world was full rather than actually missing. It looks like your movement input simply isn’t arriving at the server in time to be included in the simulation. When it arrived late, the server has already simulated the tick and the input is ignored. Your input isn’t included, so you didn’t move on the server. It was predicted on the client incorrectly, from the perspective of the server, and so the server instructs the client to correct your position. And you rubber band back. You can see on the latency graph the peaks of very high latency. The next question is why? Obviously the connection improved dramatically after going through the portal. Circarpous I is an EU hosted world. Delta Cancret is a US East hosted world. From San Diego you’ll have a lower latency connection to US East worlds than EU worlds. Go to Delta Cancret for a few minutes and grab a screen shot of the latency histogram. The histogram resets when you enter a new world. @james how does the queue system work for determining who gets to go into a full server when a slot opens up. I’ve noticed that there are people waiting to enter while on my end the portal is opened for me to enter. Were you trying to get to the world with your home beacon on it? If so you get priority over non-home players. no, it was from a non home planet to another non home planet. There are quite a few parameters that go into the priority. But in this particular case - you already had a slot and weren’t using it. As soon as you’d given up your slot (by walking away) someone else would have had the opportunity to take it. The server really cares about connections not players. You had a connection. The coming update takes more elements into account. For example if you’re looking at the portal you’ll get priority over someone who isn’t. There has been a positive side effect to this. There are far more portal and hub paths than there used to be. That should also help in the long run. I haven’t tried recently but is it the same for warp conduits? Agreed! More portal paths helps with full servers and servers that crash, as there are now more alternate routes. AH, i see. I do notice players tend to crowd right up against the portal to fight for the ability to see the portal status. 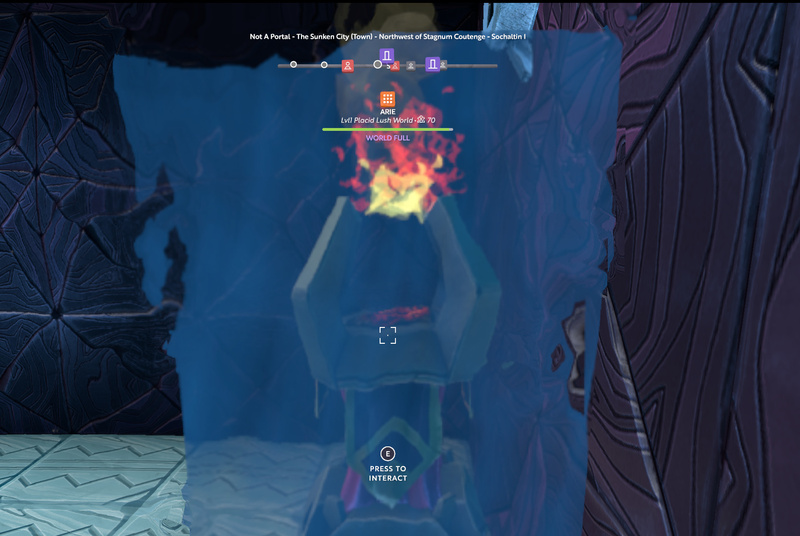 would a player viewing the portal be affected by another player intersecting with or completely blocking the line of sight to the portals?